As you can see in the photos above, work continues on the $14.4 million improvement project designed to replace the historic, 61-year-old Hell Canyon Bridge with a new four-span steel-plate girder bridge. That brand new 665-foot-long, two-lane bridge will feature wider travel lanes and will be approximately 47 feet wide, more than 17 feet wider than the current bridge. 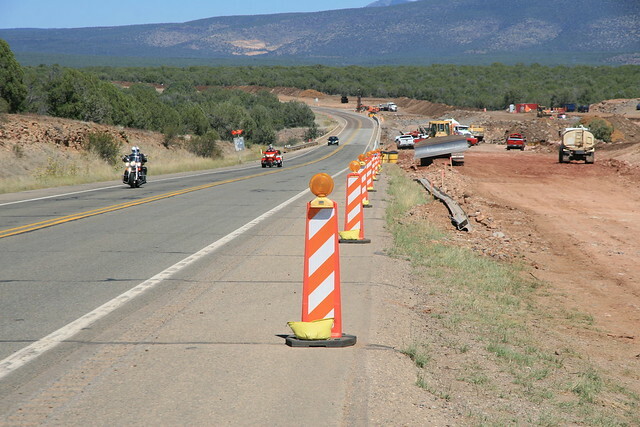 The bridge will also accommodate heavier loads, ensuring commercial trucks can conveniently carry goods and produce to their final destinations, particularly when I-40 traffic is diverted onto SR 89 during serious crashes. Right now, crews are done with the blasting work that was necessary to build the construction access roads. The project is currently moving into the next phase, which includes construction of the new Hell Canyon Bridge to the east of the existing bridge, followed by switching traffic to the new bridge and finally dismantling and removing the existing bridge. The project began earlier this summer and is expected to be completed in late 2016. For more information, revisit our previous blog post or check out the project page.